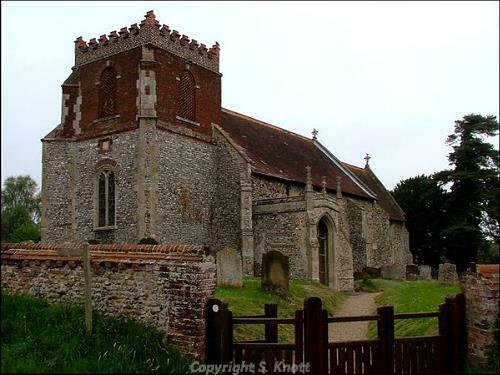 Wood Norton is a small parish in the North Norfolk Local Government District, with an area of just under 700 hectares. The parish is some 9km east of Fakenham, and is predominantly used for arable crops. The name ‘Wood Norton’ is thought to derive from the Old English for settlement at the north woods. The earliest recorded objects from the parish are five Neolithic axeheads (NHER 3083 and 11353), at least two of which were polished (NHER 3084 and 36650), and one which was both chipped and polished (NHER 12932). No prehistoric period monuments have been recorded, but an Early Bronze Age stone axehammer (NHER 3091), an Early Bronze age palstave (NHER 36169) and a Late Bronze Age socketed axehead (NHER 11355) have all been discovered here. No Roman monuments have been recorded either, and the only Roman objects to be noted are two gold solidi coins, one minted under Valentinian II and one under Theodosius I. However a number of Saxon objects have been recovered. These comprise an Early Saxon gilt copper alloy mount (NHER 36168) and small-long brooch (NHER 37190), as well as an Early Saxon brooch and Late Saxon finger or ear ring (NHER 36583), Late Saxon pottery sherds and strap end fragment (NHER 29843). It is therefore unsurprising that Wood Norton is mentioned in the Domesday Book of 1086, though it does not appear to have been considered particularly populous or valuable. The oldest building in the parish is All Saints’ Church (NHER 3103), which is largely Perpendicular in style and date. However a small amount of early work survives in the priest’s doorway and angle piscina of around 1300 in the chancel. However All Saints’ was not the only church in this parish during the medieval period. A church dedicated to St Peter was also built, and today the nave forms the body of a barn at Manor Farm (NHER 3099). From what can be seen this church was also largely Perpendicular in style and date, however it contains work from around 1200, including a blocked lancet. The church was known to be in use in the early 15th century, but by 1600 was derelict. Today it forms part of a group of farm buildings alongside which an early 18th century farmhouse has been built. No other medieval buildings survive, but the moated enclosure of Lyng Hall (NHER 3085) has been recorded, and the earthworks of a number of medieval tofts and enclosures to the east of the church (NHER 33886) are still thought to be visible. A small number of objects from the medieval period, including buckles (NHER 36080 and 35359), a jetton (NHER 36167) and a lead ampulla probably originally from Walsingham (NHER 35360) have all been discovered. A small number of buildings of architectural interest survive from the post medieval period. Norton Hall was perhaps the most important to the community during that period, and is an 18th century building of stuccoed brick with a slate roof. Perhaps of more interest is the Sun Cottage (NHER 16569). It used to be the Sun Public House, and when it was restored in 1980 a 17th century fireplace with two inglenook seats was discovered. Lyng Hall Farmhouse (NHER 32788) has an interesting outbuilding reusing medieval stonework, but of most interest is the remarkable overall ceiling of carved beams in the first floor of the house. Other buildings of note include Grange Farmhouse (NHER 46692) from the early 18th century, and Crome’s Farmhouse (NHER 47834), which also dates to the 18th century. From more recent history is Several’s Grange (NHER 19782), a 19th century house and barn built by the noted eccentric W. Philippo. In addition to these buildings, the earthworks of a possible trackway and windmill mound have been noted (NHER 33814), as well as a post medieval parish boundary stone (NHER 44628) situated on Fulmodestone Road. Few objects have been noted, but an early 17th century bi-face coin weight receives particular mention. World War Two also left its mark on the parish, which was home to various RAF bomber squadrons based at Foulsham Airfield (NHER 3100) from 1942. Although most of the runways and buildings associated with this site have been pulled up, some are thought to survive, as does a World War Two Type 22 pillbox (NHER 32446). The parish also has one of the famous K6 Telephone Kiosks (NHER 47429).